Back of card: A fantastic painting of the moon, sun, snowy mountain (? ), vines, flowers, butterflys, etc. Does not contrast well with front of card, eg, it can be hard to tell if a card is face up or down. Comments: Welcome to a realm where myth & reality are the reality. 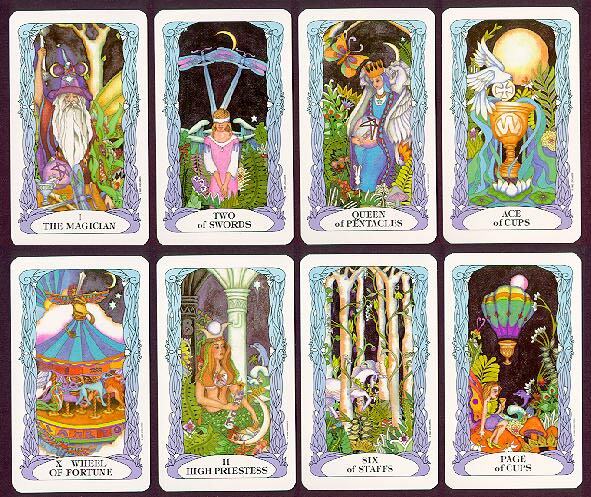 Whimsical tarot deck depicts an enchanted garden with exotic flowers, castles, hot air balloons, etc. Suits include swords, staffs, cups & pentacles.